In the new wars of the 21st century, the use of cyberpower in conjunction with kinetic military power will be a force multiplier. The Internet has become an essential component of terrorists' information operations (IOs) designed to achieve offensive strategic objectives, as future conflicts in the 21st century extend from the physical domain into cyberspace. In his “International Strategy for Cyberspace,” President Obama acknowledged that “cybersecurity threats can even endanger international peace and security more broadly, as traditional forms of conflict are extended into cyberspace.”13 In secret and without fear of retaliation, Jihadist groups and terrorist organizations are using the Internet as a tool to conduct cyberplanning—“the digital coordination of an integrated plan stretching across geographical boundaries that may or may not result in bloodshed.”14 Within the realm of Latin America and the Caribbean, as the Internet becomes an integral part of the globalized international system, the two “monster countries” Brazil and Mexico cannot be ignored. Map 1. Brazil and its Neighbors. In his book Around the Cragged Hill: A Personal and Political Philosophy, the late George F. Kennan explains that a “monster country” is a country endowed with an enormous territory and population.15 The characterization of Brazil as a “monster country” places Brazil in the same category of nations such as China, Britain, the United States, and Japan. A monster country is endowed with the following characteristics: continental territorial dimensions and a population of more than 150 million people, a tradition of economic development, and a diverse foreign trade policy. Brazil, the sleeping giant of South America, occupies half of the continent and is the fifth most populous country in the world with an estimated population of about 205 million people. Eighty-four percent of the Brazilian population is heavily concentrated in urban centers, especially São Paulo and Rio de Janeiro. Approximately 22 million Brazilians were victims of cybercrimes in 2012, and that number continues to grow. This large number of cyber-victimization occurs despite advanced capabilities in cybersecurity and deterring cybercrime, with numerous state institutions and agencies playing active roles. Even with these attempts of combating traditional crimes and cybercrime within the state, Brazil still expresses concern with criminalizing cyber offenses. The lack of a cohesive corresponding legal framework that would address these various offenses inhibits the prosecution of those who commit recognized cybercrimes. 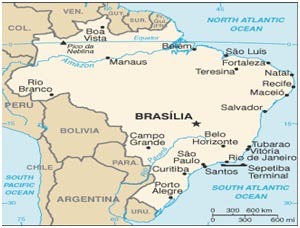 Another major concern regarding Brazil is its geographical proximity to the Tri-Border Area (TBA). Map 2. 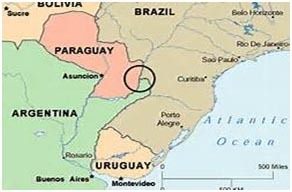 The Tri-Border Region in Latin America is composed of the cities of Ciudad del Este, Alto Paraná; Puerto Iguazú, Misiones; and Foz do Iguaçu, Paraná. Mexico is the second “monster country” in the Americas which, due to its ongoing gang related violence and drug trafficking, represents another major concern for U.S. national security in the Internet age. Mexico has an estimated population of approximately 122 million people, with 76 percent of its population living in urban centers, mainly Mexico City. Map 3. Central Intelligence Agency, Fact Book. Available at https://www.cia.gov/library/publications/resources/the-world-factbook/geos/mx.html. Given the Hobbesian nature of cyberspace, what can the United States Government and its Army do to assist the nations of Latin America in their struggle against hacktivism and cybercriminals and therefore prevent a potential enemy from attacking U.S. critical infrastructure? First, the U.S. Department of Defense and its cybersecurity organizations (U.S. Cyber Command, Army Cyber Command, Navy Cyber Forces, and Air Forces Cyber/24th Air Force) must do everything within their power to stop or at least mitigate the consequences of Distributed Denial of Service (DDoS) attacks against the homeland’s critical infrastructure. Second, the U.S. Government should shore up international support for the Budapest Convention on Cybercrime and other multilateral cybersecurity arrangements including, but not limited to: the International Telecommunications Union’s World Summit on the Information Society (WSIS) and the Global Cybersecurity Agenda (GCA), the Asia-Pacific Economic Cooperation (APEC), the European Network and Information Security Agency (ENISA), the Computer Emergency Response Pre-Configuration Team (CERT-EU), and the North Atlantic Treaty Organization (NATO)-Russia Council. This is an important step that should be taken by the U.S. Government and its cybersecurity agencies since the digital world routinely ignores national and international boundaries. Third, the U.S. Government should provide the developing world with technical and foreign aid assistance tied to the development of cyber investigation methods, cyber training, cyber policing, and law enforcement cooperation and assistance. The U.S. should assist the developing world as it joins cyberspace as a latecomer. Perhaps the U.S. Government should create a Cyber Marshall Plan for the developing world similar to the Marshall Plan created for Europe in the aftermath of World War II; when critical infrastructures were destroyed, the Marshall Plan helped in the reconstruction of Europe. The U.S. Government cannot afford to allow the developing world to become a conduit for cyberattacks against the homeland’s critical infrastructure. 1. Symantec and The Organization of American States et al., “Latin American and Caribbean Cybersecurity Trends,” Report, Washington, DC: Organization of American States Secretariat for Multidimensional Security, June 2014, available from http://www.symantec.com/content/en/us/enterprise/other_resources/b-cyber-security-trends-reportlamc.pdf, accessed on October 1, 2015. 2. Audrey Kurth Cronin, “How Global Communications Are Changing the Character of War,” The Whitehead Journal of Diplomacy and International Relations, Winter-Spring 2013, Vol. 14, Iss. 1, pp. 25-39. 3. Igor Bernik, Cybercrime and Cyberwarfare, New York: Wiley, 2014; Daniel Ventre, ed., Chinese Cybersecurity and Defense, New York: Wiley, 2014. 4. Greg Austin, “Russia’s Cyber Power,” EastWest.ngo Commentary, October 26, 2014, available from https://www.eastwest.ngo/idea/russias-cyber-power. 5. Lieutenant Colonel Eric K. Shafa, “Iran’s Emergence as a Cyber Power,” Of Interest Article, Strategic Studies Institute, U.S. Army War College, August 20, 2014, available from http://www.strategicstudiesinstitute.army.mil/index.cfm/articles/Irans-emergence-as-cyber-power/2014/08/20. 6. U.S. Department of Defense (DoD), The DoD Cyber Strategy, Washington, DC: U.S. Department of Defense, April 2015, available from http://www.defense.gov/Portals/1/features/2015/0415_cyber-strategy/Final_2015_DoD_CYBER_STRATEGY_for_web.pdf, accessed on October 1, 2015. 7. Nathaniel Bowler, “Cyber Crime and Critical Infrastructure in the Americas: Only as Strong as the Weakest Link,” Global News Matters, Caribbean News, entry posted May 6, 2014, available from https://globalnewsmatters.com/caribbean-news/cyber-crime-critical-infrastructure-americas-strong-weakest-link/, accessed on October 1, 2015. 8. Jane Fraser, “Promote Americas-wide Collaboration on Cybersecurity,” Quarterly Americas, Vol. 10, Iss. 4, 2016, p. 90. 11. Eric Schmidt and Jared Cohen, The New Digital Age: Reshaping the Future of People, Nations and Business, New York: Alfred A. Knopf, 2013. 12. Claudette Roulo, American Forces Press Service, “DOD Must Stay Ahead of Cyber Threat, Dempsey Says,” DoD News, June 27, 2013, available from http://archive.defense.gov/news/newsarticle.aspx?id=120379. 13. Barack Obama, International Strategy for Cyberspace: Prosperity, Security, and Openness in a Networked World, Washington, DC: The White House, May 2011. 14. Timothy L. Thomas, “Al Qaeda and the Internet: The Danger of ‘Cyberplanning’,” Parameters, Vol. XXXIII, No. 1, Spring 2003, pp. 112–23, available from http://strategicstudiesinstitute.army.mil/pubs/parameters/Articles/03spring/thomas.pdf. 15. George F. Kennan, Around the Cragged Hill: A Personal and Political Philosophy, New York: W. W. Norton, 1993, p. 143. 16. Peter J. Meyer, Congressional Research Service Report for Congress: Brazil: Political and Economic Situation and U.S. Relations, No. RL33456, Washington, DC: U.S. Library of Congress, Congressional Research Service, March 27, 2014. 19. Max G. Manwaring, Street Gangs: The New Urban Insurgency, Carlisle, PA: Strategic Studies Institute, U.S. Army War College, March 2005, available from http://www.strategicstudiesinstitute.army.mil/pubs/display.cfm?pubID=597. 20. Rebecca Conan, “Defending Mexico’s Critical Infrastructure Against Threats,” The Report Company, July 22, 2013. 21. Trend Micro and The Organization of the American States, Latin American and Caribbean Cybersecurity Trends and Government Responses, Washington, DC: Organization of the American States Secretariat for Multidimensional Security, May 2013, p. 7, available from http://www.trendmicro.com/cloud-content/us/pdfs/security-intelligence/white-papers/wp-latin-american-and-caribbean-cybersecurity-trends-and-government-responses.pdf. 22. José Abreu, “Mexican Drug Cartels and Cyberspace: Opportunity and Threat,” InfoSec Institute, entry posted March 21, 2012, available from http://resources.infosecinstitute.com/mexican-cartels/; and Conan. 23. With corruption reaching even the federal levels, law enforcement has been monitoring and purging corrupted officers since 2005. See Ted Galen Carpenter, “Corruption, Drug Cartels, and the Mexican Police,” The National Interest, September 4, 2012, available from http://nationalinterest.org/commentary/corruption-drug-cartels-the-mexican-police-7422. 24. U.S. DoD Press Operations, “Remarks by Secretary Panetta on Cybersecurity to the Business Executives for National Security, New York City,” News Transcript, October 11, 2012, available from http://archive.defense.gov/transcripts/transcript.aspx?transcriptid=5136. 27. Adam Segal, The Hacked World Order: How Nations Fight, Trade, Maneuver, and Manipulate in the Digital Age, New York: PublicAffairs, 2016. 28. Carl von Clausewitz, On War, trans. by Michael Howard and Peter Paret, New York: Oxford University Press, 2008, p. 30. 29. Henry Kissinger, World Order, New York: Penguin Press, 2014, p. 344. 30. Mary Kaldor, New and Old Wars: Organized Violence in a Global Era, 3rd ed., Redwood City, CA: Stanford University Press, 2012, p. vi. 31. Jose de Arimateia da Cruz and Taylor Alvarez, “Cybersecurity Initiatives in the Americas: Implications for U.S. National Security,” Marine Corps University Journal, Vol. 6, No. 2, Fall 2015, p.60. 32. Gustavo Diniz and Robert Muggah, A Fine Balance: Mapping Cyber (In)Security in Latin America, Strategic Paper 2, Rio de Janeiro, Brazil: Igarapé Institute, June 2012, p. 15. 35. Frank J. Cilluffo and Sharon L. Cardash, “Cyber Domain Conflict in the 21st Century,” The Whitehead Journal of Diplomacy and International Relations, Vol. 14, No. 1, Winter-Spring 2013, p. 41-47. 37. John Robb, Brave New War: the next stage of terrorism and the end of globalization, New York: John Wiley & Sons, Incorporated, 2007, p. 3. 38. Martin Van Creveld, The Transformation of War: the most radical reinterpretation of armed conflict since Clausewitz, New York: The Free Press, 1991, p. 197.